Ray Allman tries. Really, he does. But he’s handicapped by that Y chromosome. Still, bringing home a Christmas tree when his yuleaholic wife unexpectedly has to travel shortly before the holiday shouldn’t be that big of an issue, right? Well, let’s just call it an adventure. 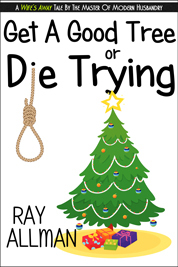 Because with a 4 year-old in tow and the wrath of his wife hanging over him, Ray goes in search of that perfect tree, but what he finds just might be the back door to hell. ‘Get A Good Tree Or Die Trying’ is a short story of approximately 6,000 words.